Part—just part!—of the three-ring circus that is Hero Comics is five pages of droolingly cool work by the inimitable talent that is Arthur Adams. 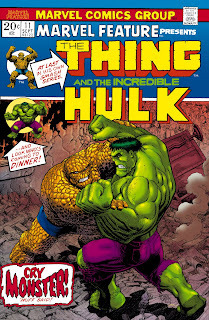 To set your taste buds on fire, we proudly trot out this Thing v. Hulk Marvel Feature cover recreation, with pencils and inks by Adams, colors by hue-master Tom Smith. And of course, our pals at Marvel Comics are graciously allowing this piece's inclusion in the book. Did we mention Hero Comics, debuting at San Diego, 32 all-new, no-ads pages? We just did? Okay, then. Want to donate NOW? Do it through PayPal! Nina Storey at 100 Bullets Meltdown party! Spidey at 600, you at Comic Outpost! Steve Dillon in Manhattan, June 24!